I strongly believe that Croydon’s diversity is one of its greatest assets. I also believe that breakfast is the most important meal of the day. Surely nothing could be better than combining these beliefs by having breakfast out in Croydon every day for a week — from a different culture each time. I started my week of breakfasts with halwa poori, a traditional Pakistani breakfast consisting of deep-fried flatbreads (poori) served with chickpea curry (cholay), potato curry (aaloo ki bhaji), and a semolina-based dessert (halwa). The poori are used to scoop up the food — no cutlery necessary. Make sure to alternate between the halwa and the curries for the full-on sweet-and-spicy experience. The friendly and welcoming owner told me how ubiquitous this breakfast is in Pakistan, and pointed out a talk show playing on the flatscreen at the back of the room, where a local political leader was being interviewed over the same breakfast I was eating in London. Other breakfast options available here include spiced omelettes; half-fried (i.e. runny-yolk) eggs; and haleem, a smooth stew of wheat, lentils, and shredded meat (lamb or chicken) eaten with freshly-cooked naan. Halwa Poori House can be found at 1033 London Road, Thornton Heath, CR7 6JF. More details here. The Turkish breakfast served at Muncho, a small cafe on St George’s Walk, might seem at first to bear resemblance to a traditional British cooked breakfast — arranged around the plate you’ll find bread, fried eggs with runny yolks, grilled tomatoes, and sausage. 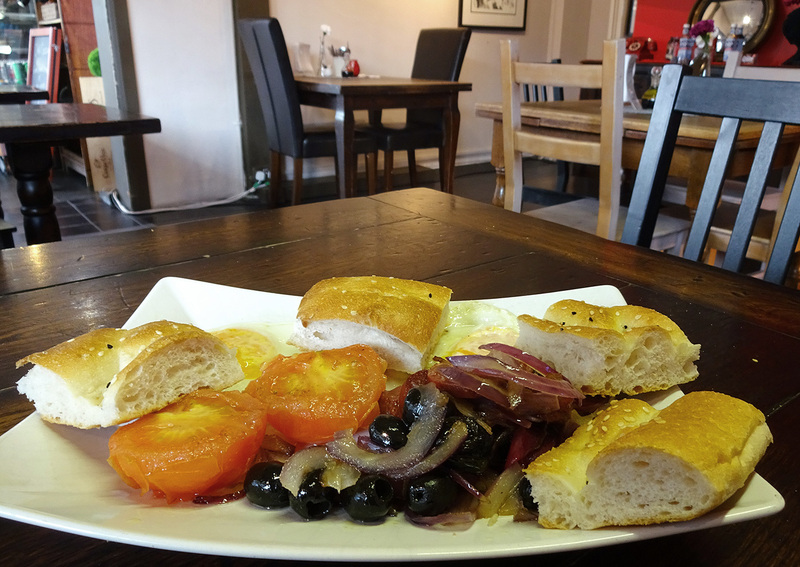 But there’s also black olives and fried red onions, and the bread is light and fluffy within a more substantial, chewier crust sprinkled with sesame seeds. The sausage is spicy, with a firmer texture than British sausages, and can be swapped out for grilled halloumi if preferred. Muncho can be found at 22–24 St George’s Walk, Croydon, CR0 1YG. More details here. This traditional Jamaican breakfast is based on a savoury stew of salted mackerel cooked with tomatoes, red and green peppers, onions, and herbs and spices. Boiled green bananas provide the starch component, with their plainness contrasting nicely against the saltiness of the mackerel. I found this on the menu at Brixton, a Caribbean takeaway and cafe just across the road from West Croydon Station. The food is all pre-prepared here, and dished out on demand from steaming pots on the stove or the chilled trays on display under the glass service counter — making it ideal for a quick stop-off before catching a train. Other breakfast options include porridge — made with cornmeal, bananas, peanuts, or oatmeal — or ackee and saltfish with fried dumplings. Brixton can be found at 21 London Road, West Croydon, CR0 2RE. More details here. Ghanaian breakfast was next on my list. Koko is a smooth, creamy porridge which may look bland at first, but ground spices are lurking within to excite the dish: ginger, cloves, and black pepper. The millet is fermented before being ground up and cooked into the porridge, which both increases the shelf life and gives it a pleasant sour tang. Some people choose to sweeten their koko, but I had it plain. I’d been hoping for some koose — a type of bean-based doughnut — to accompany it, but they’d run out so instead I had buffloat; slightly-sweetened doughnuts made from plain flour. Another popular Ghanaian breakfast is waakye — rice and blackeye beans cooked together and served with small portions of several garnishes which might include boiled egg, plain spaghetti, fish or meat stewed in a tomato-based sauce, shito (a deeply savoury chilli sauce made using dried prawns), and gari (toasted cassava flour). Mega Mall offer this ready-portioned in takeaway tubs in the fridge, and they’ll heat it up in the microwave for you if you like. Mega Mall can be found at 30-32 Station Road, West Croydon, CR0 2RB. More details here. One of my favourite South Indian dishes is, conveniently, a breakfast item. Uthappam is a thick savoury pancake, optionally studded with chopped fresh tomatoes, chillies, and/or onions, and served with chutneys and sambar (a thin but flavourful lentil curry). At Saravanaa Bhavan on George Street, the chutneys are tricolour, with one based on tomato, one on green chilli, and one on coconut. Part of an international chain of Indian vegetarian restaurants, this branch opened just a couple of months ago. Get a seat by the window, and you can watch the trams go past as you eat. Don’t forget to try their masala tea — I prefer it unsweetened — which comes in small or large sizes. The large size is traditionally served with a deep saucer which you pour the tea into to cool it down before drinking. Other breakfast dishes available here include idli (steamed savoury cakes made with a fermented lentil/rice batter), uppuma (a thick savoury semolina porridge), and several types of dosa (a thin, crepe-like pancake served with the same sambar and chutneys as the uthappam). Saravanaa Bhavan can be found at 18 George Street, Croydon, CR0 1PA. More details here. A good hotel breakfast buffet can be one of the best parts of a holiday. 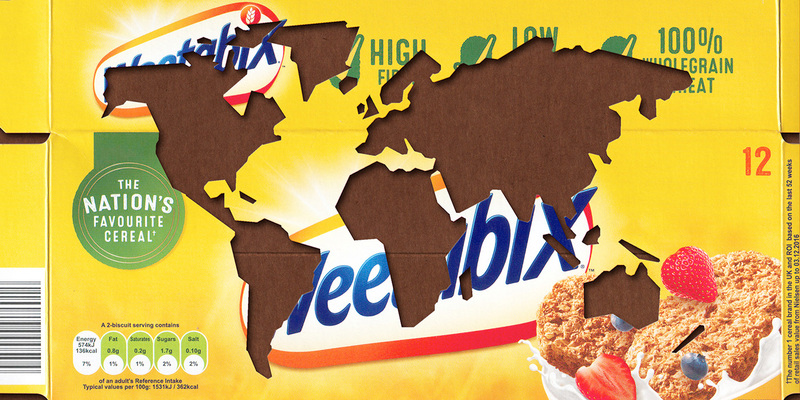 Luckily, you don’t need to be on holiday to try one. Croydon Park Hotel, just a minute or so’s walk from East Croydon Station, has a hot and cold buffet every day, and it’s fully open to non-residents. Hot options include sausages, bacon, eggs (both scrambled and fried), mushrooms, tomatoes, hash browns, and of course baked beans. Porridge is available too, with nuts and dried fruit — raisins, dried bananas, dried pineapple — to sprinkle on top. For me, the fun of a buffet is getting to try lots of different things, so after my “hot course” I had a plate from the cold section: cheese, ham, melon, and a brown bread roll, with raspberry jam and butter on the side. Pastries such as croissants are also available, and I slightly regret not having made myself a ham and cheese croissant, warmed up in the small toaster oven provided for making your own freshly-cooked toast. Croydon Park Hotel can be found at 7 Altyre Road, East Croydon, CR9 5AA. More details here. 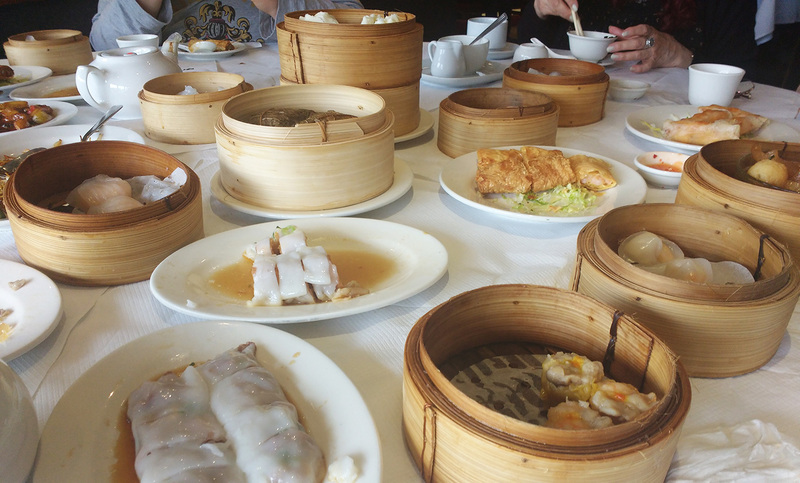 I couldn’t think of a better way to wind up my week of breakfasts than to invite 15 of my friends to join me for dim sum at Tai Tung, near Waddon Station on Purley Way. Although in London it’s mainly available from lunchtime onwards (the earliest you can get it in Croydon is 11am), in Hong Kong and other urban areas of China this is a legitimate breakfast meal served in restaurants from as early as 6am. This isn’t a breakfast you eat on your own. A dim sum meal consists of multiple small dishes of mostly savoury, mostly snack-like food, accompanied by large quantities of Chinese tea. Steamed and fried dumplings, lotus-leaf-wrapped sticky rice with chicken and mushrooms, fish balls simmered with chunks of turnip, tripe with ginger and spring onion, prawns wrapped in crispy beancurd skin… the choices seem endless, and the more people you have with you, the more dishes you can try. At Tai Tung, having a large group is a good idea for another reason — you get seated much faster if there are more than 9 of you, as they have large tables that they like to fill. Arriving at or shortly after their opening time of 11am is also a good idea — queues from noon onwards can be quite long, and they don’t take bookings for dim sum. Remember to keep an eye out for the servers circulating through the room with trays of freshly-prepared specials. These will be different every time, but we snagged a plateful of cold pork with jellyfish, while regretfully turning down the offer of seaweed-wrapped prawn rolls due to having already over-ordered on the prawn front. Tai Tung can be found at Units 1–1A, Wing Yip Centre, 544 Purley Way, Croydon, CR0 4RF. More details here. It took quite a bit of planning (and some flexible working hours) to fit all this into a week: seven breakfasts from seven countries on four continents. But you don’t have to do it that way, of course. Next weekend, why not pop out for something a bit different to start your day? Header image by the Croydonist, Croydon Park Hotel and Tai Tung photos by bob walker, all other photos by Kake.